Usually this is where I post the best comic-book cover art from the latest Dark Horse solicitations for you all to 'ohh' and 'ahh' over, but this cover art (co-produced by the fine folks at Gelaskins) is so freakin' cool, it makes my eyes pop just looking at it! 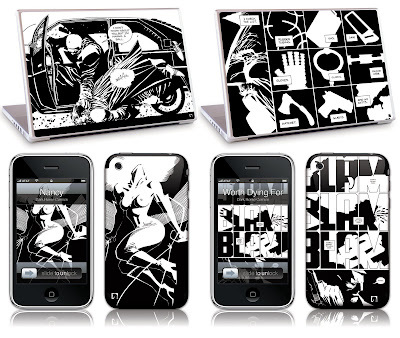 With art lifted straight from Frank Miller's hit for the Horse Sin City you can skin your iphone or 15" or 13" Laptop with its certified cool. For more March Dark Horse goodies, including the 300 Gelaskin range, and their full comic line-up, click over to CBR.